Wash the pumpkin thoroughly (use a little baking soda in the water to make sure it's really clean and a vegetable brush to scrub the dirt if necessary). Take a very strong knife and cut the top off the pumpkin (use the biggest, heaviest chef's knife you own). Scrape the seeds and filaments out of the inside of the pumpkin, then remove about 250 g. of pumpkin flesh for the risotto and set aside (use an ice-scream scoop to help you). 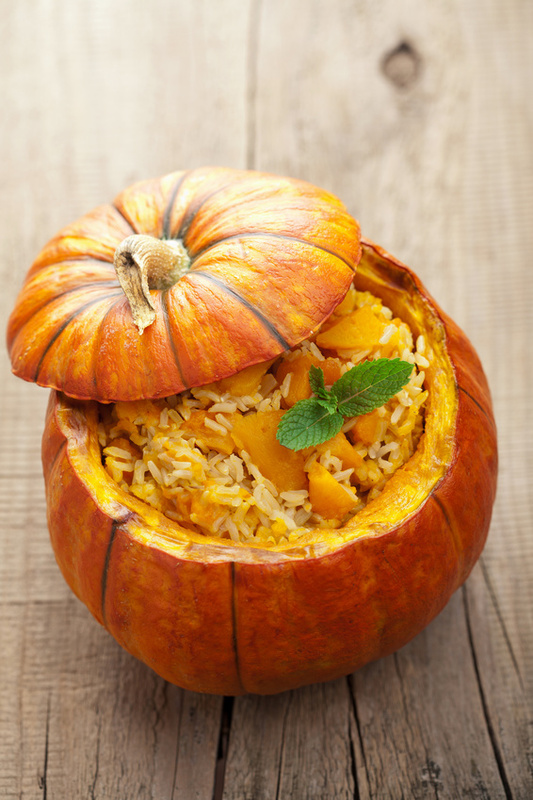 Put the empty pumpkin in the oven at 200°C (400°F) and let it dry slowly as you prepare the risotto. Start heating the vegetable stock in a small saucepan. Melt about half the butter in the pressure cooker. Whilst the butter is melting, slice the shallots thinly and then add them to the butter with a few sage leaves and gently fry until softened, but not browned. Cube the pumpkin flesh and add it to the shallots. Cook for a few minutes to build flavour, then add a ladle full of vegetable stock, close the pressure cooker and steam for 2-3 minutes. Open the pressure cooker (release the steam using the quick release method). Add the rice and toast the mixture, stirring carefully, until the rice becomes slightly translucent. Add the white wine, turn up the heat and stir until it has fully evaporated. Add the rest of the vegetable stock (which should be simmering), stir well, and close the lid. When the pressure cooker begins to hiss steadily, turn the heat down and cook for 7 minutes. Once again open the pressure cooker using the quick release method. Add the remaining butter and the Parmesan cheese and gently mix the risotto. Taste for salt. Remove the pumpkin from the oven and spoon the risotto into the empty gourd. Sprinkle with black pepper and garnish with either crispy sage leaves fried in butter, a sprig of rosemary, or mint.